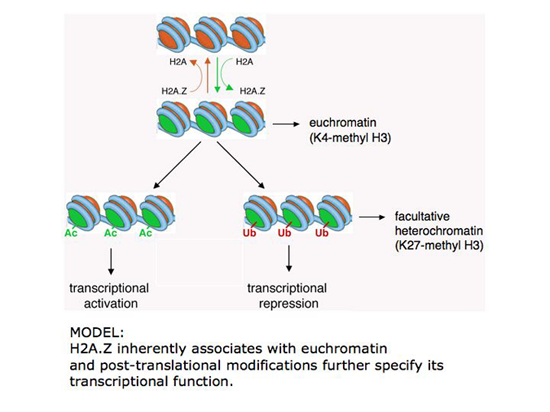 H2A.Z is the only histone variant that is essential for cell viability. Knocking down H2A.Z expression by RNAi in mammalian cells leads to cell death or senescence. Cumulative evidence suggests that this H2A variant has both positive and negative regulatory effects on gene expression. H2A.Z localizes to the transcription start sites of genes and we have found that a fraction of H2A.Z is modified by a single ubiquitin group (Sarcinella et al., 2007). Monoubiquitylated H2A.Z is associated with transcriptionally silenced heterochromatin, and is linked to polycomb silencing. Currently, we are testing how addition or removal of the ubiquitin modification on H2A.Z regulates transcription and gene expression.